Xanadu Productions for ABC Television. 1987. Producer: John Edwards. Music Producer: Martin Armiger. LP (ST)	ABC. L-38863. 1987. “YOU’VE ALWAYS GOT THE BLUES - SONGS FROM STRINGER”. All tracks vocals Kate Ceberano and Wendy Matthews except *. Backing Vocals: Wendy Matthews and Martin Armiger. The Band: Ricky Fataar: Drums. Joe Creighton: Bass. Max Lambert: Piano. Rex Goh: Guitars. Kenny Kitchings: Pedal Steel. The Horns: Tony “Spoons” Buchanan: Alto and Baritone Sax. Paul Pancini: Trumpet and Flugelhorn. Col Loughnan: Tenor Sax. Horn Arrangements by Graham Jesse. Guest Musicians: Andrew Thomas Wilson: Hammond Organ on “Guilty” and “Stringer”. Ken Francis: Guitar on “Young Love” and “Girl In The Picture”. Additional Keyboards by Martin Armiger. Produced by Martin Armiger. Recorded and Mixed by Mike Stavrou. Assisted by Neil Sandbach. Recorded and Mixed at Studio 221, ABC, Sydney. Mastered by Don Bartley at EMI, Sydney. Dolby SR Noise Reduction. The Producer would like to thank the band, especially Max Lambert, John Edwards, Martin Fabinyi and Teiqua, Studio 221. Kate Ceberano appears by kind permission of Regular Records. Executive Producer for ABC Enterprises, Diana Manson. You’ve Always Got The Blues. (4:24). (Dobbyn - D. D. Smash). (Mushroom/SBK). Back From The Dead. (3:50). Sing To Me. * (3:34). (Walker). The Girl In The Picture. (3:48). (Prestwich - Walker). (Rondor/Big Bang). 3 = 2 + 1 (Shame). (2:50). (Armiger). (Castle). Cry Me A River. (2:54). (Hamilton). (Chappell). Don’t You Take It Too Bad. * (4:04). (Van Zandt). v: Wendy Matthews, Martin Armiger. (Image). (Smithers - Grosser - Armiger). v: Joy Smithers. (Castle). The Way You Look Tonight. (2:24). 45 (ST)	ABC. K-453. 1987. Produced by Martin Armiger. Recorded and Mixed by Mike Stavrou at Studio 221, ABC, Sydney. Assisted by Neil Sandbach. Mastered by Don Bartley at EMI, Sydney. Side a: “You’ve Always Got The Blues”. (Newberry). (Control). 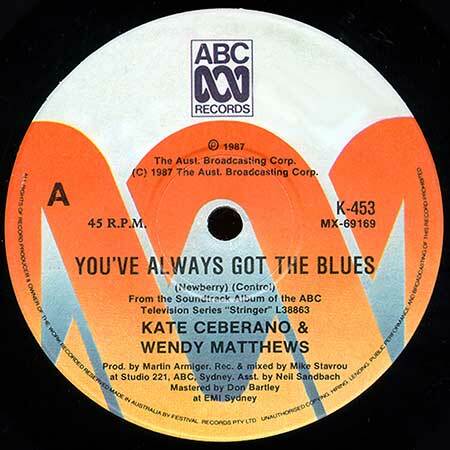 v: Kate Ceberano, Wendy Matthews. Side b: “3 = 2 + 1 (Shame)”. (Armiger). (Castle). 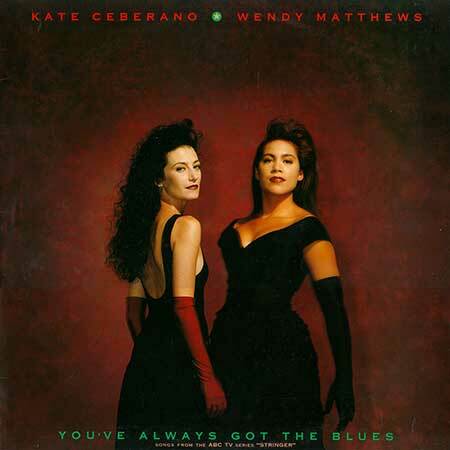 v: Kate Ceberano, Wendy Matthews. 45 (ST)	ABC. K-486. 1988. (Picture sleeve). Side a: “Young Love”. (3:43). (Smithers - Grosser - Armiger). (Control). Performed by Joy Smithers. Side b: “Stringer Theme”. (2:52). (Armiger). (Control). Instrumental.